The Siri voice assistant has many genuinely useful commands and features and a great sense of humor, but some users may wish to disable Siri on their iPhone, iPad, or iPod touch for whatever reason. Of course, by turning off Siri, you won’t be able to access the personal assistant from anywhere in iOS, and you’ll lose any of the related features on the iPhone or iPad itself, but also with any paired Apple Watch too. 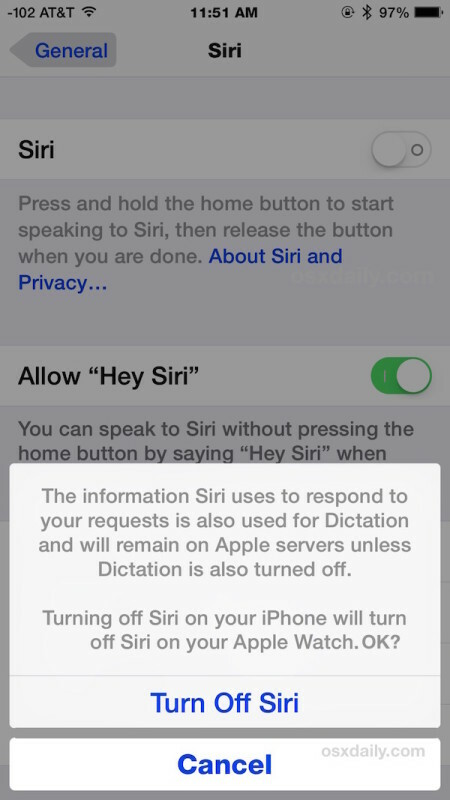 Note that by disabling Siri you’ll get a message which says some Dictation data will continue to exist on Apple Servers unless you turn Dictation off as well – this is because the iPhone processes much of the voice recognition on remote Apple servers for enhanced recognition and understanding of your voice. Whether you want to go all out and disable Dictation as well as Siri is up to you, but Dictation is the feature which lets you speak to your iPhone and convert the speech to text, which is also very useful. 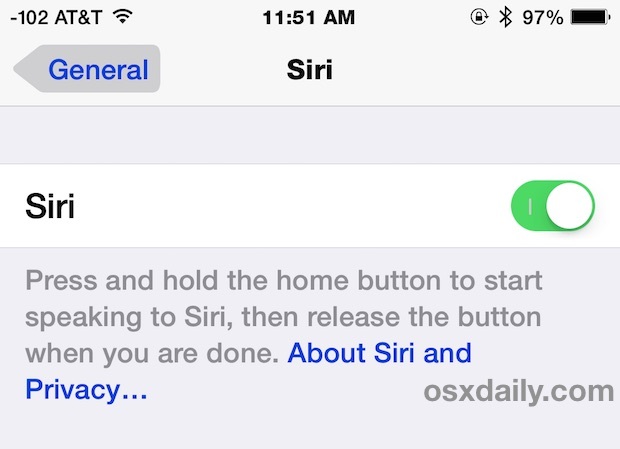 Since disabling Siri completely is quite dramatic, consider the few alternate options which may be more appropriate; if you’re concerned about accidental usage or unintentional usage, consider preventing Siri access from the lock screen as another solution, and if you find that Siri is talking out of the blue, consider just toggling the “Hey Siri” voice activation control feature off instead. These options allow Siri to continue to be summoned when desired and when intentional, but without completely turning off the handy voice assistant. As usual with iOS Settings, you can always reverse things and go and re-enable Siri again by going back to the Siri options and toggling the switch back ON again. With how useful Siri is, it’s probably best to leave enabled for most users, though there are certainly situations where it makes sense to disable, particularly for public usage iOS devices, kids iPads, or if the feature is continuously being summoned when it’s not desired. Ultimately, it’s up to you, but we recommend leaving the little artificially intelligent agent on and learning how to use the many Siri features, it’s very helpful! I use Siri all the time, can’t imagine turning it off on my iPhone. You’d be wasting a great feature, makes no sense for most of us. But, I turned off Siri on my kids iPad since it’s easy for the kiddos to do the long press and then Siri interprets kid talk as a weird internet search which inevitably winds up searching the web for all sorts of curious phrases “OK, searching Google for ‘daddy why are the cheerios round why do they taste like dog hair'” nope, didn’t need that one. I find Siri a complete waste of time, she never gets names from my telephone directory right, I can look it up and dial it faster than having Siri make 5 pathetic attempts at the right name. Yes…I speak Ohio English as a first language, Siri is the most useless utility on the iphone. You can ask Siri to pronounce it correctly and try that if you haven’t. Has gotten better in iOS 9. So far I don’t think it has messed up hearing what I am saying. I usually set reminders/timers and disable do not disturb if I get up early with “Hey Siri”. I wish we didn’t have to have it plugged in though to use “Hey Siri”! You can do alot more with Siri, but that is usually what I use siri for and comes in handy. I dictate with it now that its more reliable if I’m writing something long. Siri is doing better and I think when IOS9 comes out many will change there minds about Siri. Many improvements. I turned off Siri on both of my iPod touch V5 since it eats up too much power. also why have a Computer (basicaly a Text machine) then they kids Text on a Phone a Voice machine. This is Backwards. Just my opinion! Thanks for the tip. Didn’t realize that I could turn off that useless crap. Siri has never worked for me at all so I never bother with it anymore. I’m using the beta version of iOS 9 and it’s still crap. Ok Google works wonderfully for me so I use that. Just an FYI. When you turn off Siri and press the home button for two seconds, the old pre-Siri voice control comes up. Remember that one with the blue screen and a list of commands? How do you turn THAT one off? But I still can’t disable Voice Control. I always have to turn off the Siri feature because of lack of polish language! Disabling siri is top of the list when first setting up your iphone. It’s worse than useless. It does not learn, where did anyone get that idea? And makes akes the same mistakes over and over. The rule is, if anything only works sometimes, then it’s a waste of time. Siri is exactly that, early stage tech. I am personally hoping beyond hope that “HOUND” will replace Siri completely. When I saw the demo video for Hound my jaw hit the floor. PLEASE, Apple…pull yer head…replace the lame-o Siri with Hound ASAP!!!!!!!! I ultimately disabled Siri for privacy reasons; I want to pull out of the cloud as far as possible. I’m blind; now I am using handwriting and/or braille to make up for the loss of keyboard efficiency. Really not missing anything. Siri is, in many ways, just an illustration of how useless voice is as an actual substitute for full control of the UI. Also a nice reminder of the difficulty of touchscreens for the VI too, I suppose, but the fix again is to make it better, not to substitute an inferior interface. I would give something for offline dictation, though. Love that on OS X.
Ohhhhh I was SOOOO relieved to see “Three Fingers to Scroll” So simple. So necessary. SO grateful. So unaware. Worthless! Worse than worthless… a menace! 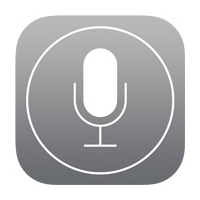 Thought Apple’s beeg deal was to make things intuitive… sure didn’t make control of Voice Control intuitive. I’ve got an iPhone 6, an iPad mini, and an iPod Touch. Siri was initially active on all. It’s now turned off for the useless bit of frippery it is, IMO. I will not argue with a circuit board over the meaning of the words I speak. The keyboard on my iDevices works just fine. There’s nothing I’ve searched for, or text I’ve entered, that requires instantaneous response, and I frankly don’t see that changing. Like so many worthless “features” that bog down our gadgets these days, the “convenience” isn’t worth the frustration. Turn off Siri and Siri will be disabled on the iPhone. Siri is useless. I do not want it or ever use it. I want to disable BOTH Siri and voice control. Both are annoying and worthless features that I will never use. I am looking for a way to disable both. I have Siri turned off (supposedly) yet this afternoon it suddenly started talking. I don’t think it can really be turned off and as far as I can tell, all it is actually capable of is frightening people with unexpected comments or complaints. I know some people claim it works and is useful – perhaps they are fortunate to have voices that fall within a very narrow range that the “feature” can handle. But how get rid of Siri. If I accedentally press home wrong way I get, shall I turn Siri on. Siri is not only unnecessary, it is an annoying nuisance. Further – when it turns itself on, unasked for, it is impossible to use the phone. Why not remove Siri permanently? I hate Siri, I have broken up to 4 or 5 iPhones chucking the dumb argumentative useless b**** at the wall. If she worked it could be nice. I am dissatisfied and f****ing pissed off that she still looks like a slappy fish of a slag in my third eye making life harder for men and women. f*** this ‘tech’ she will be disabled, not unlike getting rid of s**** u2 albums..
For the company to state that your invasive AI experiment coined “Siri” is helpful and that is programmed with a sense of humor is purely subjective. I would highly suggest you allow the user the option to buy phones (any of your devices) with this and other features excluded completely. I would use Androids exclusively but as they say “I chose the lesser of two evils”. Thank you reading (if a human actually did) and please carefully consider marketing optional features on future devices. This is my first apple device. I cannot stand Siri. Drives me nuts, every time I turn on my device Siri is like a bad smell that won’t go away. I have disabled Siri but it keeps trying to turn itself back on. I regret buying an iPad Because Siri is SO annoying and I believe it is a gross invasion of my privacy, it’s so creepy! I am not comfortable with it listening to me. it’s a huge invasion of our privacy. I can’t believe people are accepting this! NEVER AGAIN APPLE! I Will go back to a Samsung device as soon as I can as it is the lesser of two evils and easier to disable the unwanted programs. Siri is the most useless function on an iPhone. It is wrong on names, data requests and most any other query 98% of the time. If it were a live assistant I would take it out into the woods shoot it in the head and leave it for the vultures. This is clearly the Apple’s Newton attempt at AI. If Apple were to publish data on utilization we would find that the most common response Siri gets from users are insults and swear words.